Need somewhere for your dogs to play while you’re busy? Our Dog Daycare program is the answer! Whether you need just a few hours here and there or full days every day, we can help. Need to be away for a day? A week? Longer? 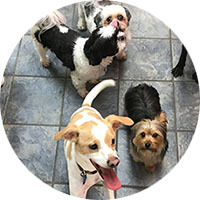 Our Dog Boarding provides your pets with a fun and safe environment whenever you need to be away. 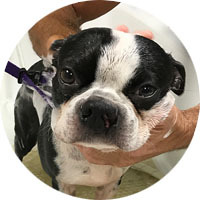 Sandy Paw’s Dog Spa provides a quiet and gentle environment to enhance your dog’s health and beauty. The spa day starts with a consultation with a stylist to custom tailor your dog’s treatment. Tired of straining your back hunched over the bathtub trying to get your dirty dog clean? We have a solution! Bring your dog to the Self Serve Dog Wash. I wandered into Sandy Paw on my walk with my dog. I wandered into Sandy Paw on my walk with my dog. I needed treats, and this place was delightful. It had great dog toys, good quality food and treats. The woman who waited on me was helpful and pleasant making for a nice, welcoming, shopping experience. When I am in Winthrop, I will shop there again. Love the BYOD concept and regularly buy Sit Stay Beg cookies. My crazy am staff puppy goes nuts for them- homemade right in Wakefield too!! Chewie the Shorkie goes here! Chewie the Shorkie goes here for haircut/grooming/wash/nail trim – the works! We specifically visit Fatima and leave Chewie under the care of Sandy Paws for about an hour or so. The facilities are clean and well-lit, so I immediately felt safe about leaving him. Sandy Paws also offers a BYOD wash, I think that’s super awesome, although I haven’t taken advantage of this service yet. Please be specific of what kind of cut you want for your loved dog! I read other reviews where people complained, if you don’t specify, it does not help anyone’s case. We usually get a puppy cut/trim for Chewie, I find that he looks his best like this. Anything shorter, he looks like a chihuahua LOL. Show the groomer a photo! Call ahead as they’re usually booked in advanced. You’ll quickly see why. They also sell a variety of treats, dog harnesses, poop bags, the works! After looking around the shop, and possibly grabbing a bite to eat next door, they’ll give you a call and let you know that your little fur baby is good to go! We always get Chewie back smelling fantastic, tail wagging, and a cute little seasonal bandana. Our pup is happy, and we are happy. 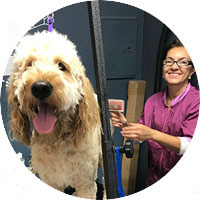 If you want a nice, clean, safe place for your pup to be groomed – this is the place to be. Love supporting neighborhood businesses, and Sandy Paws is no exception. I go in for their BYOD washing service and love the vast quantity/quality of shampoo and conditioner options to wash my mutt; not to mention I get to wash and run without having to deal with the clean up. Bonus: The retail store offers a number of human grade or high quality treats and food. If you need your little critter taken good care of, then this is the place to be. I brought my dog in today for a simple nail trim. However, she is notorious for not playing so nice when it comes to clipping her claws. Ava got along well and handled it like a champ for the very first time thanks to the kind professionals here. Everyone was helpful and very comforting to her. We have definitely found our dog groomer and treats supplier for life! I’ve had numerous dogs over the years and always managed to bathe them in my own tub. However, I just got a large furry dog in need of a bath and realized I needed outside help. 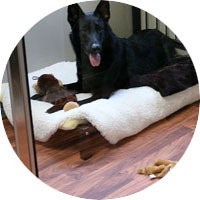 Sandy Paws provides a do it yourself set up with walk in tubs. aprons, shampoos, scrubbers, dryers, etc. So today I took advantage of this and tried it out as a walk-in customer. They also have full service grooming but I couldn’t wait for an appointment–my dog needed a bath. It was a wonderful experience! The staff was very helpful in setting us up and it was so much better than messing up my bathroom. And the tubs are stand-up height–good for the back. I will definitely be a repeat customer. They also carry a good offering of pet supplies/foods and are helpful in recommendations. Prices are very reasonable. I’ve shopped in the brick and mortars and on line so I can tell you they are competitive. 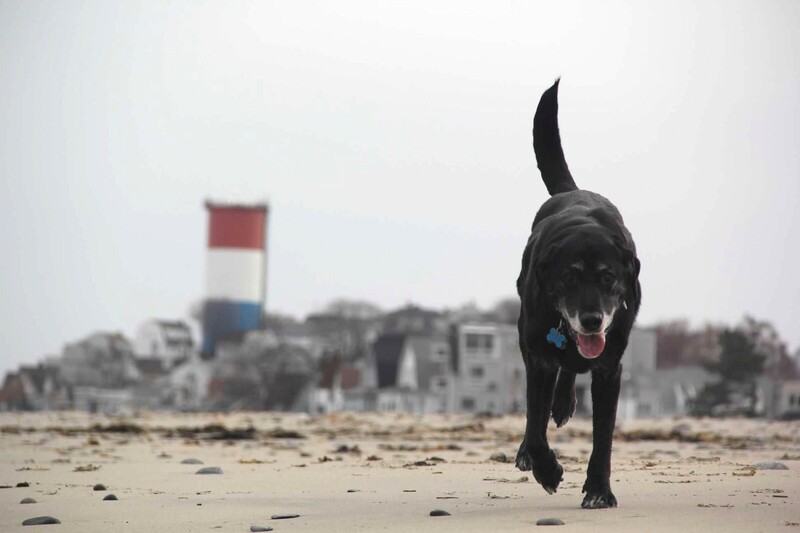 The Sandy Paw in Winthrop MA offers Dog Grooming, Dog Daycare, Dog Boarding, and Self-Serve Dog Wash.
Sandy Paws © 2018. All Rights Reserved.